​The most common way for pests to be introduced into a marine ecosystem is via ocean-going vessels. The pests are either transported in the vessel’s ballast water and/or in marine growth on the vessel's hull (‘biofouling’). Ballast water is pumped into a ship's ballast tanks to improve its stability. It is taken up or discharged when cargo is unloaded or loaded, or when the ship needs extra stability in turbulent conditions. A range of marine organisms can be taken up with the ballast water. Discharge of this water will then release these organisms into new areas where they may become invasive marine pests. The Australian Government is responsible for the management and monitoring of ballast water exchange at the international border. Biofouling is the accumulation of aquatic plants and animals on vessel hulls and submerged surfaces. Over time, many different types of organisms may attach themselves to the hull, potentially including introduced marine pests. Introduced marine pests are very likely to be first detected in ports, marinas and similar areas. While there are only a few introduced marine pests established in Western Australia at present, there is a threat from the many pests found in south-east Asia and other parts of Australia. The shipping routes of many vessels coming to WA pass through these regions. It is therefore possible that more pests may become established in the State unless we work together. Vessels from interstate and overseas may be subject to inspection by Fisheries and Marine Officers and prosecution could result if marine pests are detected. The cost of remediation and delays in your vessel’s scheduled activity can also be considerable. Learn how to identify marine and estuarine pests, and distinguish them from native species. ​Learn which species we list as introduced marine pests by checking the Western Australian prevention list for Introduced Marine Pests. 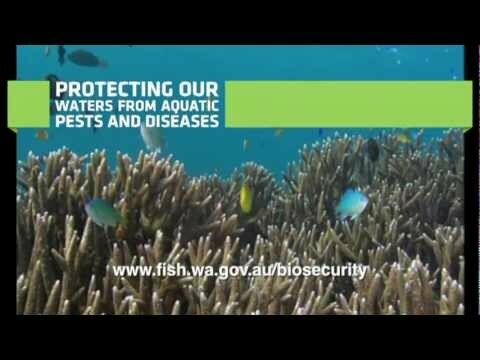 Report pests to our 24-hour FishWatch hotline on 1800 815 507, or through the WA PestWatch app or email biosecurity@fish.wa.gov.au. Prevent marine pests hitching a ride on your vessel with good vessel maintenance and effective antifouling. Moorings pose a biosecurity risk to Western Australia's aquatic environment, as they can be a stepping stone for invasive marine species (IMS) to reach new locations where they do not naturally occur. Regularly check your mooring and mooring components for any unusual species. Report any unusual species found by contacting FishWatch on 1800 815 507 or through the free WA Pestwatch app, which can be downloaded from iTunes and Google Play. Contact our Biosecurity branch for further information. The overarching aim of the workshop is to bring together representatives from maritime industries, governments and research organisations to identify, promote and develop effective and practical management strategies that will ensure shipping and other maritime industries can continue to underpin trade, security and economic development with minimal environmental impact.